The trip was offered by the wonderful Accolades International Tours for the Arts out of Minnesota. Wed. Jan. 6 We all met in Chicago to board Asiana Airlines that evening for a non-stop flight to Seoul, S. Korea. It was a LOOOONG 14-hr flight! At 6:00 a.m. the next day: Annyeonghaseyo! (Hello!) we had arrived. The runway was completely white with snow and I was wondering how the pilots could even see it at all! It was also about 10 degrees that morning, a big leap from the NOLA temperatures I had left behind. Straight away, we boarded our tour bus at Incheon airport and watched the sun rise over icy lakes and trees on our way to Ansan City. Here, we attended the rehearsal of the wonderful Ansan City Choir, directed by Shin-Hwa Park. They were very good and were working on the Durufle Requiem. Mr. Park was a masterful conductor and the beautiful bel canto singing was amazing! All of us were super tired and it was very warm inside so we were struggling to stay bright-eyed :-) but we were certainly excited to be there and happy to meet the singers and Mr. Park. Later, we also got to hear the Ansan City Children's Choir. They gave us CDs of their performances and had snacks for us in a separate room where we got to speak with their board and the director. After a very brief hotel stop, we headed out again to see a rehearsal of the Korean Children's Choir, directed by Mr. Heecheul Kim (pictured above). They were fabulous! Mr. Park is dynamic and their sound was vibrant. That night, we had a welcome dinner with several Korean choral directors at a Korean BBQ restaurant. YUM! It was awesome and I got to try several different kinds of Kimchi. I learned that pots of various marinades of cabbage and other vegetables are buried underground for the duration of the winter to make the kimchi and that there are several hundred varieties of it! For the rest of the tour, I noticed pots in practically every backyard. My favorite kind of kimchi was one that remotely tasted like a bean chili and it was not so vinegar-y. A big after dinner shock was when everyone needed to head to the restrooms. After being in the nice, warm restaurant, gathered around BBQ over coals and hot soups...the restrooms were located outside a door and in another portion of the building.......that happened to be UNheated. It was ICY cold and I could see my breath. WOW and washing my hands in more icy water was not an experience I want to repeat! The whole of Cheorwon is located at the border with North Korea so there were frequent military stops, heavily-armed gates, and lots of long, empty roads connecting poor and rather desolate small towns and farmlands. It was clear when we were getting close - air space was also being guarded and no fly zones were marked. We stopped at a place to use the restroom and were watched to & from the bus. I noticed that no one else was around and it was eerily quiet. I'm sure the icy temperatures helped with that, but it was still a little odd. I also suppose there are not many tourists, especially Americans, during the harsh winters. We arrived at the lower level of the Peace Center, Woljeong Station. This location can actually be used as a performance venue. We took a cable car up the side of the small mountain to the main building of the center. There were tons of deer down below our car and you could see a monorail coming up after us. Once inside, we could look out a large window onto the landscape of the border between South and North Korea. There, we could see electric fences, guard towers, and a mix of forest and small rolling hills. Funny that the Demilitarization Zone is among the most heavily militarized zones on our planet. The whole DMZ is 155 miles and now considered a wildlife habitat because rare plants and animals have been able to flourish where humans cannot due to the insanity of war. There are listening towers and hidden land mines throughout the countryside. We toured the center and then were escorted to another part of the DMZ area. Here, we were told that we could go directly to see the tunnel and that we were not to take pictures unless directed in certain areas. A tour guide met us and explained how this tunnel was twice as large as the first "Infiltration" tunnel, had three exits, and was about eight miles. The tunnels are thought to have been built to sneak an army of North Koreans into South Korea for invasion. They were masked as "coal mining tunnels". You can only visit this tunnel # 2 as part of a touring group. Initially, it was dark, damp, and COLD in there, but after we began our descent, it warmed up considerably. It was a fascinating tour and an insight into an historical and present situation that I knew very little about. I do not often think about this area of the world or this tenuous "peace" between North and South Korea and how many of us do? The recent death of North Korean dictator Kim Jong-Il in December 2011 and his third son Kim Jong Un becoming successor......has it changed North Korea's direction, outlook, humanitarianism, structure etc.? It brought the country temporarily into the political spotlight light.....just as recent news of North Korea's continuing vows to further strengthen its nuclear arsenal and defense capabilities understandably will keep it there. The second Infiltration tunnel was very deep and the hardest part was climbing back up the slipery and steep steps. I had a lot of trouble, BUT I made it. They let me take a picture here because it was a triumph that I made it back up. My legs were jelly for the rest of the afternoon! It was a tiny little restaurant, but we all took turns talking to him and sitting together. He is SO NICE and has a good sense of humor. He also was patient with all of us as we all wanted pictures with him. After dinner, we got to attend a performance of NANTA, the amazing performing chefs. It was HILARIOUS! I have never seen vegetables chopped so fast! The next day was full of church visits. This was for possible venues and to also hear choirs in action. The Doore Church was our first stop.It was gigantic and featured services throughout the day. It had a choir of about 150 members. We were seated together and greeted as special guests. 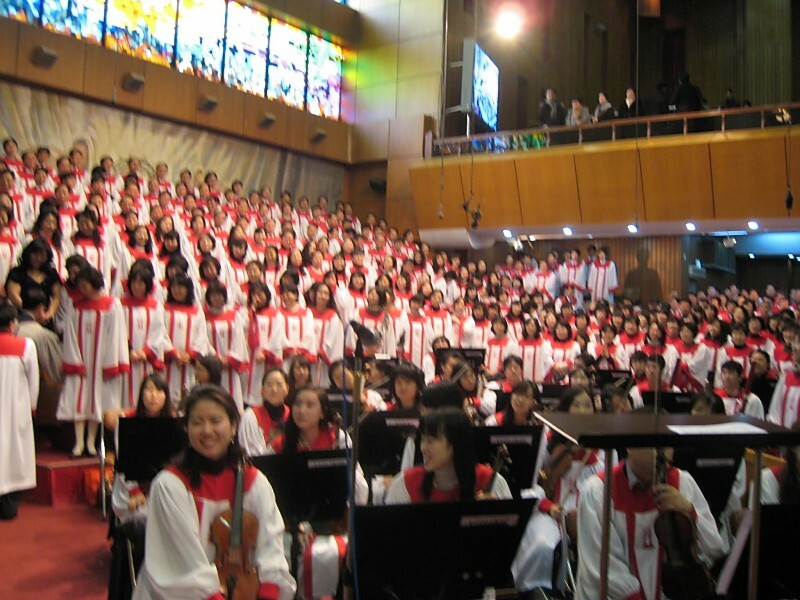 After this service, we attend one at the Myungsung Presbyterian Church. The director of music is Mr. Heechul Kim. This church is absolutely enormous and is the largest church in the world. I can believe it! The choir was easily 300 people. The orchestra was easily over 100 members. I heard that they have four other adult choirs, four or five children's choirs of at least 300 each and two more large professional orchestras over 100 each. We sat in special guest areas and were greeted and stood to a welcome of thunderous applause. THE WHOLE CONGREGATION SANG BEAUTIFULLY! I was impressed beyond words. The last church we visited was the Haeorum Church with music mission pastor Hyungsoo Kim. We had a tremendous vist with World Vision and heard their children's choir. It was here that I saw an old colleague and fellow singer from the Atlanta Symphony Chorus - Heechurl Kim, who was doing some directing with the World Vision choirs. They were phenomenal. They presented a video of the World Vision program to us and then we were treated to a choral performance which included native Korean dances. After this, we had a Seoul city tour and a fancy dinner with members of the Korean Ministry of Tourism and past presidents of Korean ACDA. Now, I must tell you here that I do not like certain foods and any friends reading this may have a chuckle : p but I have tried the foods I disliked....some even several times, in hopes that my tastes would change. This meal was to impress us all. It was SIXTEEN courses. After dinner and a brisk walk, we attended a fantastic performance by MISO. It was my favorite performance. 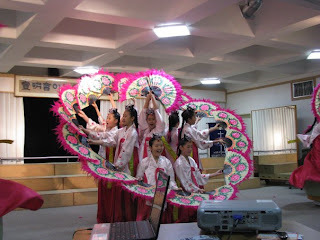 This group played native Korean and Chinese instruments and we heard several different folk singers. Different members danced symbolic dances while others sang/played. The last portion of the evening was an acrobatics show. I have only seen such things at the circus. The performers were amazing! They had the audience involved and up out of their seats!!! For the next day, we visisted possible performance venues out in the suburbs of Gwachon, Ilsan (in Goyang province), and Bundang. In the afternoon, we left for Daegu and had dinner at the Grand Hotel. Daegu is a gorgeous city and is the fourth largest city in S. Korea. It has ruins of prehistoric pit-houses, agricultural fields, and megalithic burials (dolmens) and was thought to be a walled city. Today, we took a tour of the Daegu Opera House. It has four floors and seats 1,500. It's shaped like a grand piano! 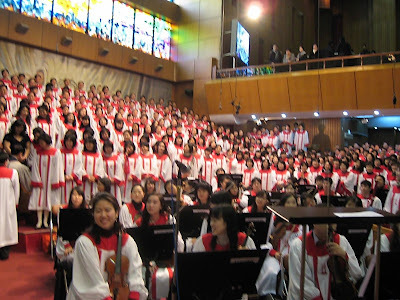 Afterwards,we visited the Pilgrim Mission Choir, conducted by Lee Jae-joon. This choir won the Grand Prix in the International Festival of Choirs in 2010. During the break in watching their rehearsal, we were each given the chance to introduce ourselves, tell about our jobs and schools, and to say something about choral music. Then, one of the American conductors, Brady Allred from Utah, worked a piece with them. Afterwards, we had a grand reception and were able to interact with the singers and lots of Korean choral conductors who had come to meet us. It was a marvelous time, but a little overhwelming and humbling that they had come to meet and talk with us! The next morning, we went to a church on the US Army base and then met with some people at the Daegu Culture and Art Center and the Keimyung Art Center. Both are state of the art theatres which house performances of all kinds for the city, region, and country. Somewhere on the tour, and I honestly cannot remember which day, we were able to visit a homeopathic type of museum. We saw the history of healing medicines and were able to buy authentic Ginseng teas and candies. It was in a community that had tons of shops, most for a specific item to be ground, used in cooking, or used another way. I've never seen so many dried mushrooms in my life! The next day was our last day, but it was one of my absolute favorites! We visited the UNESCO World Cultural Heritage sites and the EXPO center. 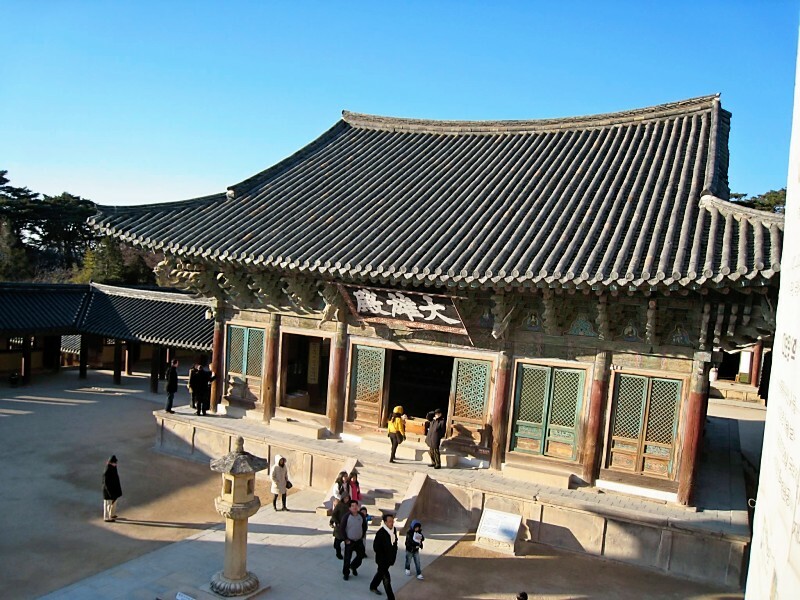 The first site was an historic center with a wealth of Silla Kingdom history, statues, pagodas, artworks, and more! It also had a gift shop (YAY!) Gyeongju was the "capitol" of the Silla clan and has ruins of ancient temples from the 7th through the 10th century. My favorite artifact was the giant Silla bell. 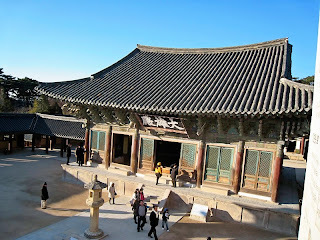 Our last stop was another UNESCO site - the gorgeous Bulguksa Buddist temple on a small mountain. It was the last light of the day and the temple, adorned with designs, carvings, left-facing Buddhist swastikas, and art, gave us a sense of eternal peace. In the freezing 6-degree cold, we explored the grounds and then peeked into the temple. One last look at Korean countryside came with the sunset and is my favorite picture that I took while there. Our farewell dinner was super delicious and we all sat on floor pillows. It included a Korean cake for me since it was my birthday. What a wonderful blog! I remember you mentioning that you went to Korea when we were in Innsbruck, but it's nice to hear about it and see the pictures too.